While babysitting and playing with my favorite model yesterday, I took advantage of the opportunity to practice with my new 50 mm lens. I’m still struggling with the focus, but I’ll get there eventually (I hope). I wish the sharper focus were more on her eyes and less on the beads. 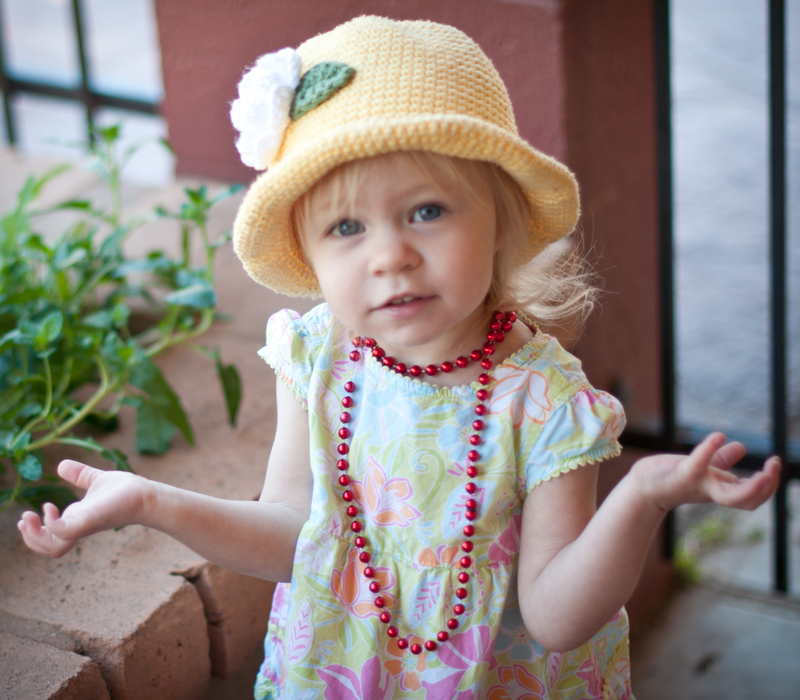 She loves wearing hats and is beginning to like girlie things like beads and sparkly shoes. She is also a fearless tomboy who climbs on top of everything (just like her father) and loves airplanes, helicopters, and trucks. And so do I! I have two sons and this one granddaughter. Adorable! Also, as for your picture quality…I really like the lighting in this shot. It was a really nice use of the natural light.A really cool photography that has some great videos about lighting and “portraiture” is Karl Taylor. I was turned onto him by a friend. Good stuff. Keep it up! Real cutie! I see what you mean about the eyes and the beads. I did not catch that in camera. But I’m learning. As my son says, take thousands of shots. I don’t think I posted the one with the sharp focus on one eye. I think I’ll dig it out. Thank you, Inga. She’s delightful too. My Grandson (Hayden age 5) also thinks she is cute. I will tell her that. I’m sure she’ll giggle. One day you will both look back at these photos and be overjoyed that you took them. She is sooooooooo precious! I believe that it is RIGHT that all grandmothers believe that their grandchildren are the BEST. Children need people cheering them on and if their parents and grandparents don’t, what hope do they have? You have such an adorable granddaughter. My son being 5 pretty much runs when I take my camera out of the bag so I know how good it can feel when little ones are in a cooperative mood. I know. It’s funny how some days she’s a great ham and others she will have nothing to do with the camera.